There are two Paul Weller’s. The good Paul recorded classic solo albums like his self- titled debut, Stanley Road, and Heavy Soul, which wrapped Weller’s smooth production around rock, R & B, jazz and techno influences. Weller’s sonic demarcation line is 2004’s Studio 150, a compelling collection of unlikely and little-known covers. The bad Paul surfaced with 2005’s As Is Now, which emphasized Weller’s ragged vocals and punk posturing that typified his first band, the Jam. 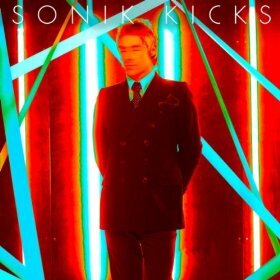 Weller’s eleventh solo effort, Sonik Kicks, combines good Paul with his adventuresome, bad self. In the songs that don’t work, (mostly the ones done at break-neck speed), Weller tries too hard to be relevant and edgy, resorting to too many techno tricks. Fortunately the rest of Sonik Kicks is equal to Weller’s finer efforts. “By the Waters” is a serene ballad with soft acoustic guitar and florid strings; the equally unplugged “Devotion” finds Weller in such a casual 60’s frame of mind that he whistles his way through the outro. His love for 60’s R & B takes center stage in “That Dangerous Age” in which an overdubbed Weller serves as his own version of the Supremes (“Shoo-oop! She’s at that dangerous age!”). Known affectionately as “the Modfather” in his native England, Weller’s releases are practically guaranteed #1 status in the U.K. (including Sonik Kicks). Weller’s less well-known in the U.S., but his latest collection should kick his popularity up a notch or two.